You set your alarm the night before and got out of bed as soon as it went off. You poured hot, fresh coffee into your favorite mug (or maybe you enjoy tea) and took a seat in your favorite chair. Now you are in a quiet room or sitting on your porch. You pray, asking God to speak to your heart as you read His Word. That’s what we want when sit down with our open Bibles–to hear God speak directly to our need. But we don’t always hear Him. Or maybe our quiet times seem mundane. 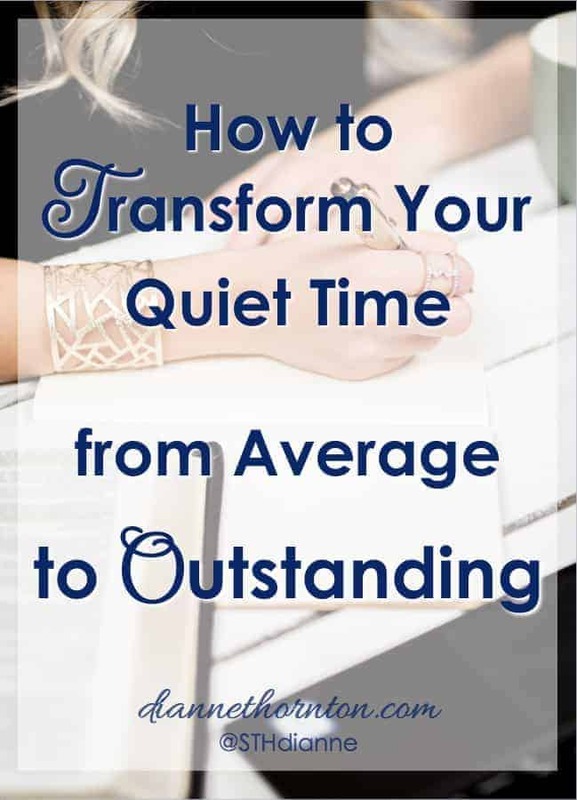 One simple thing can transform your quiet time from average to outstanding. Before you start to read, pick up a pen or pencil and be ready to write. When we are ready to write, we are ready to hear. When you read with a pen in hand, you read expectantly. You are prepared and looking for something to underline, highlight, circle, or star. Your mind is alert. And then it happens! The words before you take on new meaning, and you capture that nugget of truth. The chapter continues with a description of what happens to those who pursue immoral women and ends with the blessings of those who remain loyal to their wives. In context, these first two verses begin the contrast of the lips of the wise with the seductive lips of the adulteress. We must be careful not to take Scripture out of context. But as is the case here, the principle of listening and learning, and how it works itself out in our lives, is timeless–and taught throughout the Book of Proverbs. But I had not noticed it here until I focused on the theme of words. That’s what readiness and expectancy does for you. We can take this a step further by writing out the verse(s) that triggered our ah-hah moment. How did they capture our attention? What are we thinking about it? Sometimes I take the verse apart and rewrite in in my own words. This writing down does several things for our learning process. First, simply writing out the verses clarifies our understanding. Writing takes more time than reading, so we have to slow down. While we write, our minds start working it out. As we transfer our thoughts to paper, more thoughts come. Sometimes I’m surprised by what I write. Either because I’m looking at what I believe, and I discover it needs correction. Or, the Holy Spirit begins to illumine truth, and now I understand what I didn’t before. Second, the process of writing imprints messages on our hearts and minds. You engage multiple senses when writing. Of course you use sight. But you also include the sensory experience of touch. You actually feel the pen dragging the ink across the page. If you read aloud as you write, you add another layer. The more senses we engage, the stronger a thought or experience is imprinted on our lives. When we take the time to write out Scripture, we interact with it multiple times. Once in our initial reading. And at least twice more when we copy it down. We read phrase by phrase, and we copy it phrase by phrase. When I write down a verse of Scripture, I probably read it ten times before I’m finished. I read through it a couple of times before I write it down. I read it after I’ve written it down. Usually, I compare translations. All of this extra reading doesn’t happen without the writing. Together, God’s Word finds its home in our hearts. Ready to be recalled when we need it. Finally, writing creates a record of our learning and our relationship with God. God speaks to us through His Word. Writing is our response to Him. Not just the Scripture we write, but how it impacts us during our lives. Our writing becomes a memorial. 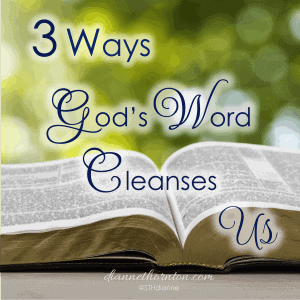 Later, we can go back to see what God taught us through His Word. Throughout my life I’ve swung on the pendulum of journaling pages and pages every day, to not writing a word for years. I’m back to writing. Not every day. 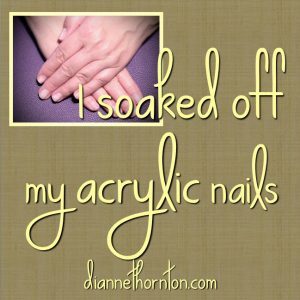 But often enough that I can trace God’s work in my life. I can see the areas where God is working, where I was resistant, and when I finally yielded. I’ve chosen to love it. So keep a journal handy. It doesn’t have to be two inches thick and bound in leather. A simple spiral will do. I love to write with different colors of ink. But that’s not necessary either. Use whatever you have around. However! If having a special journal and favorite pens makes writing, or journaling, more palatable, then go for it! With the transfer of mind to hand and ink to paper, thoughts come alive and understanding deepens. Make yourself ready to hear what God wants to say to you by reading with a pen in hand. 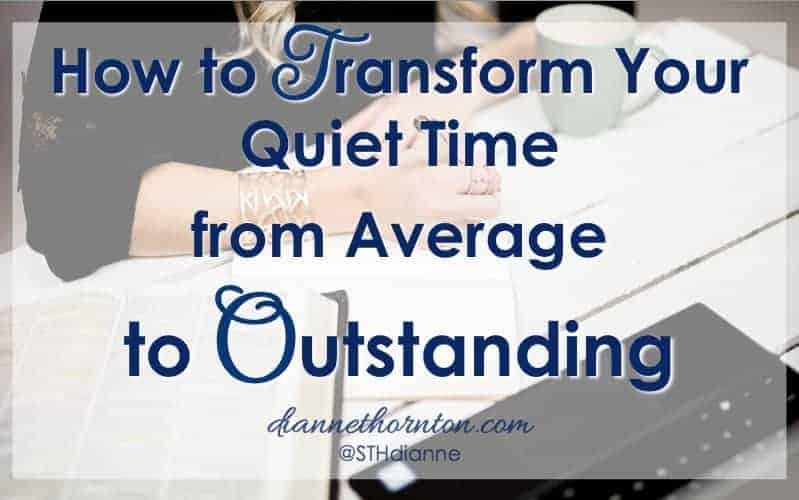 And watch God transform your quiet time from average–to outstanding! I’ve gotten out of the habit of writing out a verse every day. Thank you for this reminder, Dianne. It really is such an important part of our daily quiet time. 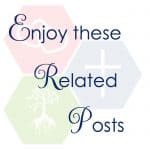 I’ve so enjoyed connecting with you on Pinterest this week and sharing all of your wonderful posts. There’s so much beautiful encouragement here in your space on the internet :)! Thanks for your sweet encouragement, Candace. I appreciate it. I love everything about this post, Dianne! I’m a diehard writer downer. 🙂 And I do notice such a difference on days when I just don’t have/take the time to note something down. Less clarity on what I think God might be saying or on what application I can make in my life. I love how simply having a pen in hand makes us more alert to what God wNts to say to us!! Thanks, Darlene, for taking time to read and comment! Great post! This morning I wrote out James 1 and it was cathartic. 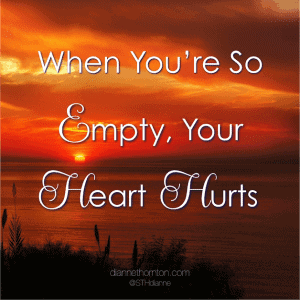 Great to see you on The Grace & Truth Linkup today! James keeps surfacing! I think God wants me to camp out there, soon! I agree, I find writing so helpful for connecting with God more deeply. It seems to slow my mind down and helps me focus better and process more deeply. Love your tips and emphasis here, Dianne. And I’m with you on writing out the Scriptures and my reflections on them. I have been doing that for years, including writing out my prayers. Both disciplines of journaling prayers and notes have revealed so much that simply reading and praying (out loud or internally) could ever do. Thanks for this and I’ll be pinning this to my spiritual tools and tips board. I really appreciate this idea of reading with a sense of expectation because God never disappoints when we come to him through his word with this kind of attitude. And writing, well, that’s such a sacred place for God to lift his truth off the page and into our soul. Thanks, Candace. Have a great weekend! These are wonderful suggestions, Dianne! My variation is to write down the names of God as I read every day, and then also to type my prayers. (It’s the only way I can stay focused on what I’m doing!) I love your point about how writing creates a record of our learning and relationship with God. So true! 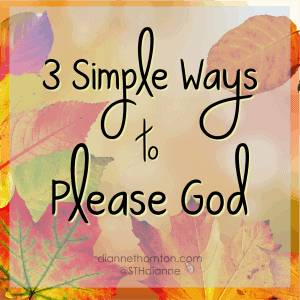 Hi Diane, these are such great tips for having a great quiet time with God. I will have my pen in hand from this day forth. Thank you!